This Saturday’s meet begins at 8:00 am. The bus will leave East at 6:30 (and not 6:00 am, as previously announced). Entries can be found here: ThunderRidge_Invite_2018_Entries_1 (revised 3/16). Be sure to bring layers of clothes for changing weather (the meet is scheduled until 5:00 with a 30 degree range in temperatures), as well as lots of water, and several healthy snacks. MARK YOUR CALENDAR: Chipotle Fundraiser Tuesday 4-8:00. The team gets 50% of what we bring in. Parents, come by the social room (2nd floor) from 5:00-6:00 pm Tuesday to meet other parents and find ways to get involved this season. Uniform check out, Wednesday’s relay meet and more! Here’s what is coming up for track & field. Tuesday, March 13 at 2:45 pm in the counseling office: Check out your uniform if you are competing this Wednesday or Saturday and don’t have a uniform yet. You must have attended five practices and be academically eligible to get a uniform. 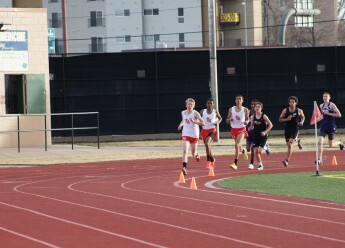 Wednesday, March 14 – DPS Relay Meet at City Stadium. What to bring: athlete-equipment Please remember, it gets cold at City Stadium in the late afternoon/early evening. Bring layers and a blanket to keep warm. Parents: Join the coaches and other parents for light appetizers and to see how you can get involved as a parent volunteer. Chipotle Night – Tuesday March 20 from 4 pm – 8 pm at the Colfax and Columbine location. The team gets 50% of all sales on 3/20/18 from 4 pm to 8 pm. Grab dinner and tell all of your friends to do the same. Be sure to tell the cashier that you are supporting East Track & Field so we get the credit. As always, thank you for supporting the team – you are Angels!! Click here to see the google Track & Field calendar: Schedule/ Calendar. Click the Blue +Google Calendar tab to add the track schedule to your calendar. You must be academically eligible. You must have attended/or will attend 5 practices by Tuesday, March 6th. You are competing in the meet on Wednesday. Thank you and see you this afternoon! Practice will be held at East tomorrow from 10-12 noon. We will meet on the track.